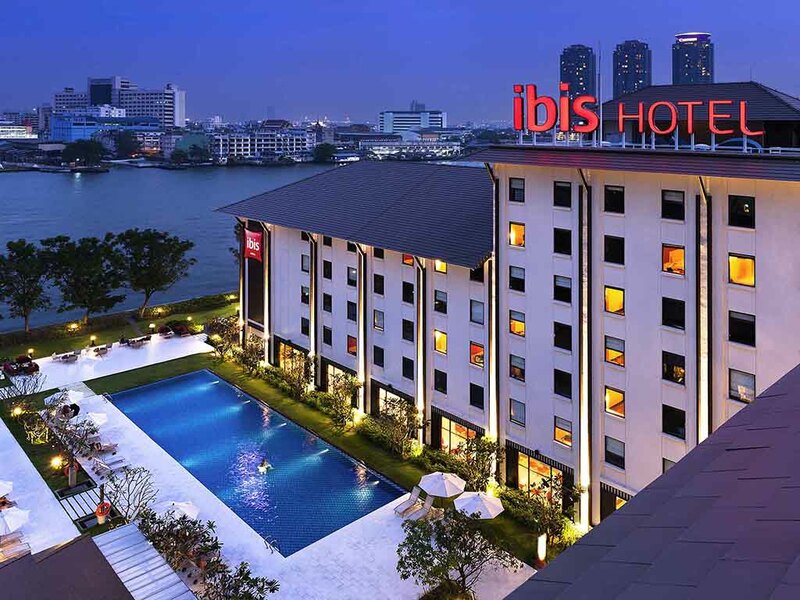 Next to Chao Phraya River and near shopping and dining venue ICONSIAM, ibis Bangkok Riverside is a fresh, fun and friendly hotel offering great value and beautiful views. Guests are just a short shuttle ride away from the BTS SkyTrain and river taxis to Asiatique, Wat Arun and the Grand Palace. Rooms include a cozy double or twin beds and WIFI. There's also a riverfront swimming pool, restaurant and bar. Guests can take ferries on the Chao Phraya River to city highlights including Wat Arun, Wat Pho, the spectacular Grand Palace, the flower market, and the riverfront shopping and lifestyle destination, Asiatique. The BTS SkyTrain is also nearby. Located in the heart of Southeast Asia, Bangkok is a modern and lively city with a variety of attractions to offer. The bustling city is filled with magnificent palaces, diverse cuisine from world-class restaurants to street stalls and shopping malls. Guests can take ferries on the Chao Phraya River to city highlights including Wat Arun, Wat Pho, the spectacular Grand Palace, the flower market, and ICONSIAM-the riverfront shopping and lifestyle destination, Asiatique. The BTS SkyTrain is also nearby. Close to ICONSIAM,Asiatique, Wat Arun and the Grand Palace. The Lobby Bar serves a wide selection of international drinks and beers, along with snack food available 24/7 to enjoy at the bar or take to your room. A hotel in a good location. Staff were okay but not as friendly as we expected a Thai welcome to be. Room was basic but clean. Pool was always very busy but it was in the holiday season. Breakfast was acceptable. I most loved the location which is very convenient, the room was comfy, similar like other Ibis hotels. I didn’t experience the f&b and pool as only one night stay, So I have no idea about it. However, the check in and out had been hectic and always busy, Reception staffs were not welcome, attentive and not even glanced to the guest while they were waiting for help. But I would like to thank you the foreigner guy who I met at reception both checked in and out, He was the only one approached me and offered assistance nicely. Excellent location, but reception staff disappointing! Arrived at the hotel around 5 pm, no eye contact or greeting from the reception staff for at least 3 minutes! I greeted them first, unfortunately. I was shocked, as I was there with my husband (he is British) that the receptionist asked if we were in separate rooms, even though she could see clearly the names in the passports. Also, I had to take it upon myself to highlight that I was an existing Le Club- Silver member. A very disappointing way to be greeted, which hasn't matched all of the other Accor hotels we have stayed in through the past year. We've been coming to this hotel for a number of years. The Hotel staff were lovely and the location is perfect for us. However the rooms are very tired and in need of updating and redecorating. The breakfast is also fairly bland and not very interesting. We will probably look for a different hotel next time we are in Bangkok. Come to stay again. Its great change of feeling. Mattress make more comfortable while add a thick bed pad. Flies is gone, no more terrible in buffet breakfast. Although you got a seat in open space. Nice hotel you can try. I liked the hotel, my room and the swimming pool. However, as soon as I arrived, I mentioned Reception that the extractor fan in my bathroom wasn't working. The mirror was constantly steamed up, making really hard to shave, or brush my teeth. I've reported this issue 3 times to Reception over 3 days. No action was taken to fix the problem. After many long stays at this hotel it is like a second home. All staff are friendly and helpful, the rooms have everything we need and the restaurant food is good and well priced. Any the hotel has the best riverside view in Bangkok. Very comfortable with excellent location. Most staff were very helpful and friendly. facilities overall very good and room satisfactory. Bathroom is very small. I like the hotel location and the room is clean. If possible, I would like to suggest to have porridge rice for breakfast. We were enjoying breakfast and sunbathing by the pool on the riverside. I left the hotel at 9 o’clock and was back at 4 pm. But the room wasn’t tidy up. That made me unsatisfied because I was tired and wanted to sleep a bit. Please hire more than only one maid to clean up the room.